We are always welcoming new Cub Scouts. You may join the pack at any time. To contact us, please click on the Cubmaster's or Committee Chairs email link on our home page. You're also welcome to come visit a Pack meeting, it's a great way to see what we're all about. Usually our Pack meets on the 3rd Tuesday of the Month at Elm Creek School at 6:45pm. We have a few Pack meetings that are held at a local park. Cub Scouting means "doing." You will have lots to do as a Cub Scout in Pack 211—crafts, games, sports, songs, stories, puzzles and much more!. A lot of the fun happens right in the den and pack. The Cub Scout Motto is "Do Your Best." Everything girls and boys do in Cub Scouting has a purpose. Apart from the fun and excitement, the aim of Cub Scouting is to help girls and boys grow into good citizens who are strong in character and personally fit. This is why we say that Cub Scouting is "Fun with a Purpose". The den, a group of Cub Scouts that are in the same grade level, usually meets every other week. The Pack, all of the Cub Scouts from kindergarten to fifth grade, meets once a month from September to May. At both the den meetings and the pack meetings, Cub Scouts do different things for fun and learning. When you have earned a badge, it is given to you in front of the whole pack. Once a year, usually in May we have a bridging ceremony. During this time the Scout receives his new rank. The parent(s) are ask to present this new rank, showing that it is a family, daughter/son, leader, pack relationship. Cub Scouts in Pack 211 have a lot to choose from. Traditional annual events include the Outdoor Flag Retirement ceremony in September, our Christmas Party in December, the Pinewood Derby in January, and the Blue and Gold Dinner in February. Extra events include winter downhill tubing, family picnics and summer camping. The past few years we have brought back the Raingutter Regatta and Minnow racing. We practice citizenship by taking part in community events, marching in parades, volunteering with community projects, and helping out when asked. The membership fee for new Cub Scouts is $71 total, This is $11 that covers the remainder of 2018's calendar year registration and $33 covers 2019's registration with the National Scouts of America. A pack activities fee of $27 is also included in the total, It is payable when you register this fall. For returning scouts the fee is $60 total including $33 for Registration for National Scouts of America and $27 for Pack activities fees. Included in your scouts membership is also a Scouting Life Magazine. Trophies, ribbons, pinewood derby cars, raingutter regatta kits and banquet supplies. Cub Scouts participate in popcorn/wreath and other fundraising events in September and October and money earned by the scouts can be applied to the renewal fee. For more information about Pack 211 fundraisers, contact the Committee Chairperson or Cubmaster. 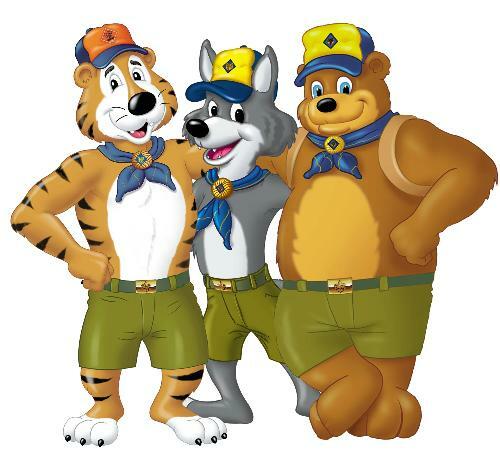 Tiger Cubs, Wolf Cubs, and Bear Cubs must wear the official uniform blue shirt, neckerchief and slide. Webelos may choose the blue or khaki official uniform shirt, Webelos neckerchief and slide. Lion Cubs wear the Lion Cub T-Shirt to all events. They will begin wearing the official uniform blue shirt when they become Tiger Cubs. Hats, socks and belts are optional. Navy blue pants, shorts or jeans. Boys also have the option of wearing Pack 211 "Class B" t-shirts during Den meetings and "dirty" community service, such as painting or planting. A pack is a group of Cub Scouts, adult leaders and parents who belong to the same Cub Scout unit (e.g., Pack 211, Northern Lights District, Northern Star Council, Boy Scouts of America). A pack generally draws its membership primarily from an elementary school, church or community that is associated with the pack's Chartered Organization and Community. Each pack is made up of Lion Cubs (Kindergarten), Tiger Cub (grade 1), Wolf (grade 2), Bear (grade 3) and Webelos (grades 4 & 5) dens. A Chartered Organization is the sponsoring organization for a Cub Scout pack, usually a church, PTA, homeowners' association or other community group. The primary responsibilities of the Chartered Organization are to select the leadership of the pack and provide a meeting place. Each year, the pack must renew its Charter with its local council. The Chartered Organization must approve the rechartering application in order for the Charter to be renewed. Pack 211 is chartered to Advent Lutheran Church in Maple Grove. A den is a small group of boys (ideally 6-8) of the same grade level. Each den meets on a weekly or bi-weekly basis to work on achievements and other activities. The den is led by adult Den Leader and Assistant Den Leader, whom are responsible for planning and conducting each den meeting. Pack meetings are generally held monthly on the third Tuesday of the month at 6:45 p.m. from September through May. Pack 211 meets at Elm Creek Elementary. The Pack Calendar provides exact dates, places and times of all pack meetings. The pack is run entirely by unpaid volunteers. We always welcome people who would like to help out, and have large and small jobs for every family. Ideally, each family should volunteer for a job, which is what we are working towards in Pack 211. The Den Leaders and Assistant Den Leaders are most directly involved with the Cub Scouts. Dens generally meet weekly or bi-weekly, a Den Leaders meeting is held monthly (in conjunction with the Committee Meeting) to discuss issues of common concern (first Tuesday of every month). An adult member of each Cub Scout household is expected to participate in a volunteer position or serve on a committee. In addition to Pack Committee and Den Leader positions, Pack 211 generally tries to fill several volunteer positions (e.g., Membership Chairman, Advancement Chairman, Den Leader Coach, Lion Cub Organizer) and have several committees (e.g., Blue and Gold Banquet, Pinewood Derby, Popcorn/Wreath Fund Raiser, Camping and Scouting for Food, Roadside Clean Up) Lend your skills and make our Pack more fun for the Scouts!